The George foreman Champ Grill is a fast and efficient grill for preparing a large hamburger or 3 chicken breasts for 1 0r 2 people. It’s small and light in weight, qualities that make it portable for traveling purposes. It can be easily fitted at the corner of the kitchen giving you enough space for utensils and washing area. It takes about a minute to heat up once the indicator light goes off making it very efficient. It’s convenient than charcoal since it works pretty fast. Cleaning and maintenance is quite easy something that makes it very useful. The grill is very light and can be held with one hand. It makes it easy to hold it with one hand while the other hand can be used to add or remove pieces of steak from it while still avoiding running hot water to the underside where there is wiring. This also makes it possible to create enough space in the cooking area. You can also fit it in your travel bag without any difficulties. The grill heats up pretty fast making very easy to prepare any kind of stuff for you. In fact, it heats up within 4 minutes once you fit it in the socket and can prepare your meal in 20 minutes. Talk of pork, salmon, steak, chicken, lamb just but to touch a few. It’s also possible to have a preset temperature which the grill maintains very well. The GF grill does not increase your bills and hence fuel effective. It’s possible to use the grill daily and still enjoy the performance for over a year. It’s very easy to clean the grill after preparing your meal. You just need to unplug and wait for a few minutes to cool. From there, you can immerse in water or clean up while holding it with one hand. Plastic spatulas should be used to avoid Teflon being scratched by metal types. The George Foreman champ grill is pocket friendly. The grill can heats up pretty fast at the centre making it cook irregularly. That speed of cooking can lead to overcooking. The grill does not contain the on and off switch making it difficult to switch on and off. This can only be done by unplugging from the socket, something that is dangerous to the user. The power cord is short and this gives limitations to the area the grill has to be fitted. In addition the grill is very light with no feet and hence can spill over the food. The plates aren’t removable something that makes them difficult to clean. The Teflon and the nonstick handle don’t last for long and break off easily making it more difficult to clean those areas. 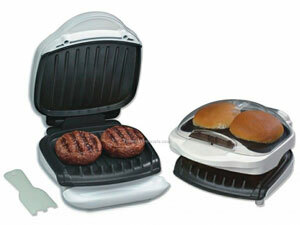 George foreman’s grill is the best tool for preparing meals for one or two people. It’s very fast, uses less electricity and easy to clean. The best tool to prepare your favorite stuff when on travels due to its portability.